Afton Post Office served the area of Lower Stinson where my paternal great grandparents (Asberry & Mahala (Curnutte) Carter moved their family ca 1900. The Hezekiah Ash mentioned here as postmaster was Hezekiah King Ash, husband of Mahala (Curnutte) Carter's sister, Sirena Isabella (Curnutte) Ash. It was told to me by older family members that Asberry and Mahala moved to Carter County from Lawrence County partially due to Hezekiah and Sirena having moved there. Virgie (Carter) Withrow, my paternal aunt, told me that the earliest settlers on what my family calls Carter Branch, where Carters settled, were the Ash family and that the earliest graves in what's now called the Carter Cemetery were those of the Ash family. I don't recall at this moment which census it was but Hezekiah was an enumerator for at least one census of this area. Asberry and Mahala Carter lived in the old log buidling that had been the Afton Post Office. 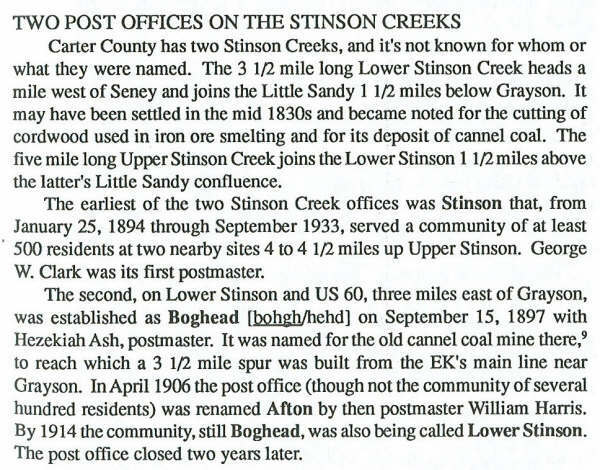 The essay about the Afton Post Office is from Robert M. Rennick's "Post Offices of Northeastern Kentucky".